Looking for a Used G37 in your area? CarGurus has 2,282 nationwide G37 listings starting at $3,999. The 2009 Infiniti G37's many positive features start with its impressive power and performance, and also include its quick, confident handling, head-turning exterior styling, and well-equipped interior, as well as its new smooth-shifting seven-speed automatic transmission. Some owners would like to see better fuel economy from the '09 G37's engines, and most will find the back seat and trunk space cramped, especially in coupe trims. 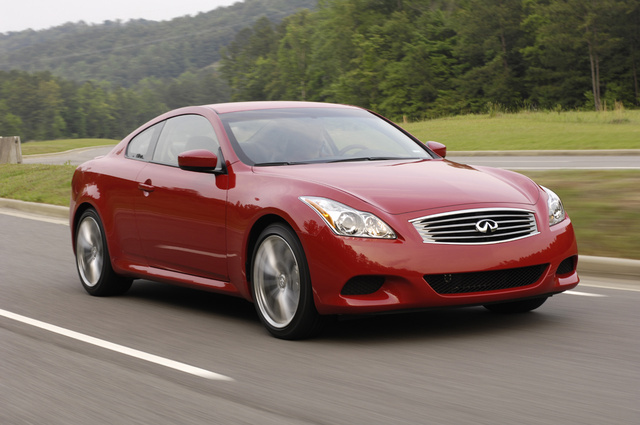 The G37 lineup comes of age in 2009 with the addition of four sedan trims and an all-new convertible trim. With its rocket-like performance, well-tuned suspension, and comfortable cabin, as well as its competitive price point, the G37 looks like a serious challenger to the European rear-wheel-drive sport coupes and sedans. Prospective owners should give the G37 a good, hard look and put it through its well-heeled paces before purchasing an alternative vehicle in the rear-wheel-drive midsize category. A year after its debut as a sport coupe (taking over for the G35), the Infiniti G37 receives a number of new features for 2009, including all-wheel drive and a new seven-speed automatic transmission. In addition, all G37 trims receive new Scratch Shield paint with a self-healing clear-coat finish as a standard feature. The G37 lineup also adds the G37 Sport Sedan for 2009, which replaces the previous year's G35 sedan and receives a boost in horsepower. 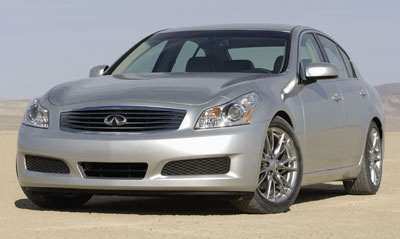 In addition, Infiniti adds a new G37 Convertible for 2009 to fill out the lineup. The G37 Coupe serves as Infiniti's answer to such high-performance vehicles as the Audi TT roadster, the Jaguar XK, and the BMW 335i. It features a sleek, aerodynamic shape, a low stance, a swept-back roofline, and a sculpted hood that's deeply curved where the hood meets the front fenders. Available trims include the rear-wheel-drive Base G37 Coupe, G37 Coupe Journey, and G37 Coupe Sport 6MT, as well as the new all-wheel-drive G37x Coupe. The new G37 Sport Sedan retains the same basic design and suspension of the previous year's G35, but now comes equipped with a more powerful V6 engine. Like the G37 Coupe, the sedan trims include the rear-wheel-drive Base, Journey, and Sport 6MT, and the all-wheel-drive G37x. The all-new G37 Convertible, which Infiniti will introduce in mid-year 2009, will be the first open-air trim in the G lineup. Based on the G37 Coupe, the G37 Convertible will feature a three-piece automatic retracting hardtop and unique optional interior treatments. In addition, it will come equipped with audio and heating/cooling systems designed for open-air driving. U.S. News and World Report ranks the 2009 Infiniti G37 the number one upscale midsize car out of a field of 17 and calls the G37 a serious competitor of the BMW 3 Series, thanks to its aggressive performance, impressive handling, and wide range of trims, which offer something for just about any driver. The Infiniti G37 Coupe delivers good performance, thanks to its 330-hp, 3.7-liter double-overhead-cam V6 engine with Variable Valve Event and Lift (VVEL) technology, which continually adjusts valve lift and timing to provide quicker response, improved fuel economy, and lower emissions. 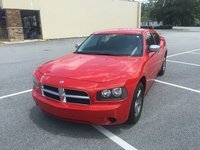 The V6 engine produces 270 lb-ft of torque for aggressive acceleration, and manages a respectable 18/26 city/highway mpg. The new G37 Sport Sedan receives a 328-hp 3.7-liter V6 engine, which also features VVEL technology. 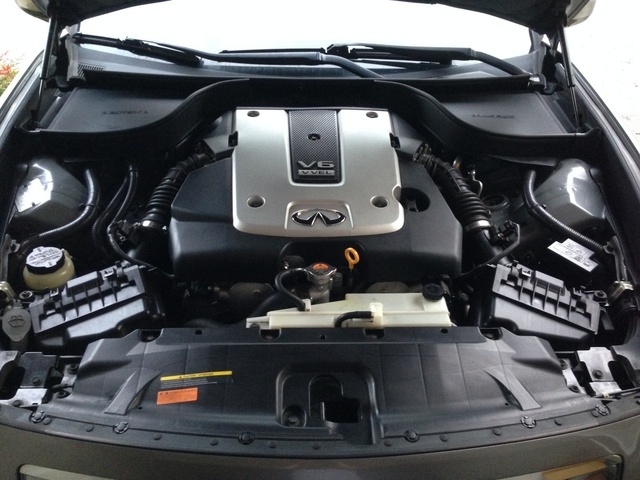 The sedan's V6 produces 269 lb-ft of torque at 5,200 rpm, which drives the G37 from 0 to 60 in just 5 seconds. In all coupe and sedan trims except the G37 Sport 6MT, the V6 links to a new seven-speed automatic transmission with a manual-shift mode and a driver-adaptive algorithm, which senses the driver's style and makes adjustments to shifting patterns accordingly. The automatic also features Downshift Rev Matching, which automatically opens the throttle when downshifting to match rpm, resulting in smoother shifting, according to the automaker. For a sportier driving experience, the G37 Sport trims come equipped with a close-ratio six-speed manual transmission with a short-throw shifter. The all-wheel-drive systems in the G37x trims provide rear-wheel-drive responsiveness under typical road conditions and all-wheel-drive traction when road conditions turn slippery or when hurtling through tight corners. Infiniti offers optional sport brakes for sedan trims, with four-piston front and two-piston rear calipers, and large 14-inch front and 13.8-inch rear rotors. The G37 handles tight curves and twisty roads with great agility and stability. It stays straight up when stopping or turning quickly, and exhibits practically no body roll or sway. In addition, it delivers precise steering and confident braking. The G37 rides on an independent front and rear suspension, with a double-wishbone configuration and coil springs over shock absorbers in the front, and a multilink configuration with coil springs, shock absorbers, and a stabilizer bar in the rear. Speed-sensitive variable-assist power rack-and-pinion steering comes standard on all trims. A Sport Package, which comes standard on the Sport 6MT trim and is optional on the Journey trim, adds a sport-tuned suspension and a viscous limited-slip differential. In addition, reviewers highly recommend the optional four-wheel Active Steer system, which provides even tighter steering response and handling. The G37 Base, Journey, and G37x sedan trims come standard with 17-inch wheels, while the Sport 6MT rides on 18-inch wheels, which are optional on the Journey trim. The Base, Journey, and G37x coupe trims come standard with 18-inch wheels, while the Sport 6MT trim rides on 19-inch wheels, also optional on the Journey coupe trim. The G37's seats provide good comfort and support over long distances. Side bolsters in the Sport 6MT keep front-seat occupants firmly planted under heavy cornering. The seats and cabin provide plenty of headroom for taller drivers. All trims offer good legroom for front-seat passengers, although back seats in the coupe trims can be tight for taller adults. The sedan trims offer better legroom in the back seats. Interior storage spaces include the typical cupholders and map pockets, but not much else beyond that in the way of interior bins and storage areas. Despite the cramped back seat in the coupe trims, the G37 gets overall good marks from drivers and reviewers for its interior, although some note it doesn't quite reach the standard set by BMW with its 3 Series. In addition to its comfortable seats, the G37 offers a high level of refinement, with quality materials, soft-touch surfaces, and a driver-oriented cockpit. Key features for both the G37 coupe and sedan trims include leather seats, power-adjustable front seats, Washi-finish interior aluminum trim, a leather-wrapped steering wheel and shift knob, and a six-speaker audio system with an MP3 input jack. All trims except the Base also include a 6-CD changer. Options such as a navigation system with a 7-inch color display, a rear-view monitor, and Bluetooth hands-free phone connectivity are available for all trims except the Base coupe and sedan. In addition, heated front seats are available in the Journey and Sport 6MT trims, and drivers can add sport seats with manual thigh extensions on the Journey and G37x AWD trims. Drivers of coupe trims will find cargo space limited, due to the coupe's body design, which results in only 7.4 cubic feet of space in the trunk. The sedans offer more cargo room, which checks in at 13.5 cubic feet. The G37 achieved a top score of five out of five stars from the National Highway Traffic Safety Administration for all crash tests except frontal impact crashes. When it comes to protecting front-seat passengers in those types of crashes, the G37 received four out of five stars. Standard safety features for the G37 include four-wheel antilock brakes, a slide-away brake pedal assembly, and an advanced airbag system with roof-mounted curtain side-impact airbags. Other safety features include electronic brakeforce distribution, which automatically adjusts the amount of brake force applied to the wheels to improve braking performance, and brake assist, which applies maximum brake pressure in emergency situations to help drivers control the vehicle. The G37 also comes equipped with Vehicle Dynamic Control, which applies brakes and reduces engine power as necessary to keep the vehicle from skidding or slipping in emergency situations. The G37's power, sporty styling, and agile handling (even in snowy conditions) all appeal to owners. Its aggressive acceleration and quiet, smooth ride also draw positive comments from owners. In addition, owners find the optional navigation system intuitive and easy to use. Owners of the Sport 6MT single out that trim for positive comments, calling it fast and responsive, with a throaty exhaust note. Overall, owners find the G37 a very good value when compared to some of its European competitors. CarGurus owners also give the G37 good marks, especially the coupe, which provides exhilarating performance and competes ably against such vehicles as the BMW 335i. They also like the G37's head-turning styling, aggressive torque, and refined interior. On the downside, CarGurus owners point out such negatives as excessive road noise (especially for trims with performance tires), fuel economy, and blind spots out the rear and sides. What's your take on the 2009 INFINITI G37? GuruLTP7T Speedometer hard to read in daylight. Wish it had a digital speedometer. Users ranked 2009 INFINITI G37 against other cars which they drove/owned. Each ranking was based on 9 categories. Here is the summary of top rankings. 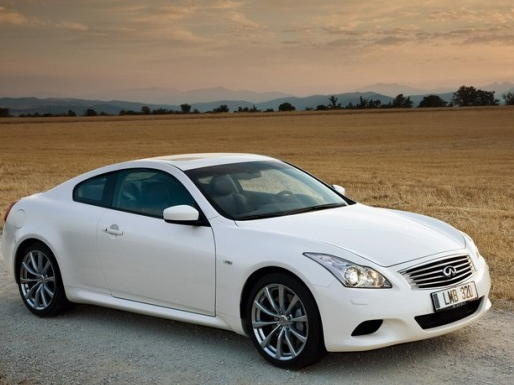 Have you driven a 2009 INFINITI G37? After car starts it continues to turn over of an additional 3 to 5 seconds. It is doing in more frequently. I'm afraid it is going to burn up my starter. No clue what is causing it.